Ahmad Abuznaid's story of growing up in both the United States and Palestine helps us understand how he has become the nationally recognized activist he is today. 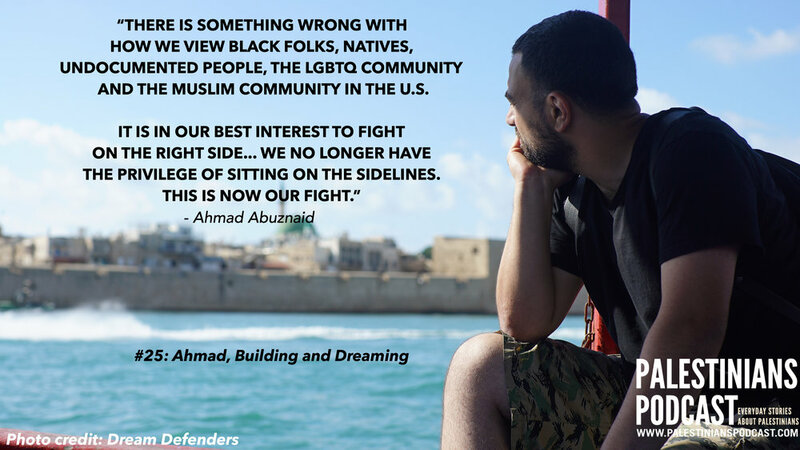 As a co-founder of the Dream Defenders, Ahmad's advocacy in the United States reminds us that as Palestinians we are called to be in unity with other liberation and social justice movements around the world. We hope this special Black History Month episode of Palestinians Podcast inspires you to contribute your voice to social movements in the United States and Palestine. Music in this episode is by Project Chaos. You can read more about Ahmad, the Dream Defenders, and Project Chaos on our website. Thank you for your continued support! Happy listening!